Please select options for Rough Country 2 in. Leveling Lift Kit w/ Shocks (15-19 F-150, Excluding Raptor) at the top of this page. Hey, everybody. I'm Justin with AmericanMuscle.com and this is my review and install of Rough Country's two-and-a-half-inch leveling kit with rear shocks, fitting your 2015 and newer F-150. 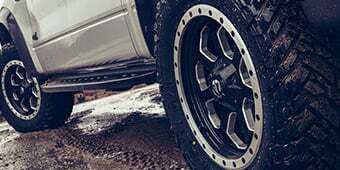 A leveling kit's gonna be the easiest and most affordable way to change the altitude on your new truck without totally altering the ride quality in the process. 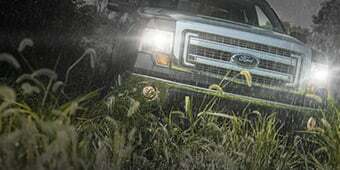 Now, you should be checking out the Rough Country kit if you wanna get rid of the factory rake on your new F-150. You wanna get that front end in the air a little bit more to match the rear, giving you some more ground clearance in the process. Now, this is also going to be a great way to stuff a bigger wheel and tire under your new rig. In fact, Rough Country says you can easily squeeze 33s under there, but I've personally seen guys run 35s on a two-and-a-half inch level. It's all gonna come down to your offset wheel and tire size. Now, in thinking about going with a leveling kit as opposed to a more involved full suspension lift kit, I'd probably ask you what you're gonna be doing mostly with your truck. Is it gonna be a daily driver, or a tow rig that will be on road most of the time, or do you plan on subjecting your rig to some serious off-road duties? Well, if it's gonna be mostly a family hauler with some occasional tow duties, I'd probably say the leveling kit is great way to go for the reasons I already mentioned. It's gonna save you a ton dough and it's also gonna be much easier to install, saving you some money there. Now, most leveling kits are gonna consist of some kind of strut spacer for the front or some kind of strut extension. That is the case here with the Rough Country kit, but this kit's also pretty nice in the fact that it does include some stuff for the rear. You're looking at additional one-inch blocks for the rear along with their premium Rough Country N2.0 shocks. Now the rear is something you guys can experiment with at home. Again, this is a leveling kit so expect a pretty level stance when installing this full kit. But if you do want to maintain the slightest bit of rake, meaning the front's gonna be slightly lower than the rear, then you might wanna go with a slightly larger block for the rear. Again, something you can totally play around with on your own. Check out the forums or the product page for more info there. Breaking down the individual components of Rough Country's kit here again, we do have the front strut spacers, T 60-61 build aluminum. Very nice material here, guys. Basically gonna help resist any corrosion or rust over the years. Just add to the durability of the product. Again, guys, this is Rough Country's two-and-a-half-inch leveling kit, so expect the front to be raised roughly two-and-a-half-inches when installed when compared to your factory ride height. In addition to the front setup, Rough Country does again include some premium N2.0 shocks, the one-inch additional rear blocks that you will use in conjunction with your factory blocks, and finally, some longer U-bolts. 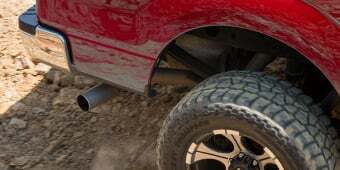 Now, the rear shocks are a nice addition as they are designed for on and off-road use, and they do include what Rough Country calls their velocity sensitive valving technology, which is gonna basically react like an adjustable dampener, but you're not gonna have to mess with any knobs or adjustments, anything like that. It's gonna do it for you all on the fly. 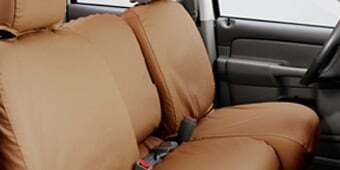 Now, Rough Country claims this provides excellent ride quality on the highway and some solid control in gnarly off-road situations. And if you should ever need it, guys, this entire kit is backed by their lifetime warranty. On the topic of price, guys, the Rough Country kit is going to be one of your more premium options here at AmericanMuscle.com. But again, you do have to factor into the price that this does include a bunch of stuff for the rear, which a lot of the other kits do not. Ultimately, guys, again, this thing is only gonna run you a couple hundred bucks. Compare that to a couple thousand dollars with those full suspension lift kits. And you're gonna have to think this thing is a bargain when your number one objective is just to get the truck in the air a little bit more and stuff a bigger wheel and tire under there. I've said it before, guys, but I'll say it again. A leveling kit is going to be much easier to install compared to the more involved suspension lift kits. But overall, there still is a fair amount of work. I'll call it two out of three wrenches on my difficulty meter, and a few hours from start to finish in the garage. Now, of course, you will need to remove your front struts in order to install the brand new spacers, along with removing the factory rear shocks, and installing the brand new Rough Country units along with those one-inch block extensions. Again, not a terrible amount of work, but you do have to know what you're doing in the garage. So make sure you have a good set of tools on hand. A lift will definitely be your friend here, but if this all sounds a little bit too intimidating, don't be afraid to leave this one up to your local shop. So to summarize, guys, Rough Country two-and-a-half-inch leveling kit will be a solid and affordable way to get the truck in the air a little higher. It'll easily fit 33s and even possibly 35s with a little modification. So be sure to learn more about the Rough Country kit here, at AmericanMuscle.com. Remove the Factory Drop. If you love your F-150, but could do without that factory drop in the front, then the Rough Country 2 in. Leveling Lift Kit w/ Shocks is the perfect kit for you. You will be able to maintain your factory ride quality while removing all of the awkward drop in the front. This two-inch lift is more than enough to make up for that factory drop and provide you with the stance and aggressive look that you are after. This kit comes to you with rear shocks that allow you to maintain that factory ride that you have come to love. You will be able to enjoy a tough look without all of the performance mods to make that happen. Whether you want to beef up your daily driver or ensure your weekend off roader can handle the terrain, the Rough Country 2 in. Leveling Lift Kit w/ Shocks is perfect and accommodates tires up to 33 inches. Best Ride Quality. When you purchase the Rough Country 2 in. Leveling Lift Kit w/ Shocks, you will receive a new set of shocks for your truck. These shocks will provide you with the impact absorption you want, but you never have to worry about their performance or them altering your ride. You can enjoy the factory ride experience as these shocks play to that and preserve it. Aluminum Spacers. The Rough Country 2 in. Leveling Lift Kit w/ Shocks comes with aircraft aluminum spacers to provide you with the durability and strength that you need for your truck. These spacers are made to be lightweight, so they will not weigh down your truck. Bolt-On Process. The Rough Country 2 in. Leveling Lift Kit does not require you to modify your truck to install the parts. In fact, you will find that this kit is completely bolt-on and all you need are some basic hand tools, as all hardware is provided to you. You can expect the entire installation process to take about three hours. Further Protection. Backed by Rough Country's lifetime limited warranty, you'll be protected from defects in this kit for the life of your truck. Some exclusions apply, please see manufacturer's full warranty for details. Application. This Rough Country 2 in. Leveling Lift Kit with Shocks is specifically designed to fit on all 2015 to 2019 2WD and 4WD F-150s. It is not compatible on the Raptor model. Will I need upper control arms with this kit for my 2017 F150 4 x 4. Also have the alignment done most concerning is my lower control arm bolts are maxed adjusted towards the outer part of the vehicle. Is this normal after being leveled or should I have another alignment shop take a look. Adding upper control arms will help relieve some stress on the ball joints. But your issue is pretty normal for vehicles with this kit on. will installation void extended warranty? A leveling kit should not void the factory warranty. However, we highly recommend contacting your dealership to confirm what will and will not void the warranty on the vehicle. The Rough Country 2 in. Leveling Lift Kit w/ Shocks will make your truck sit more level yes. Will adding the rear 1" blocks and shocks in this kit make the rear a bit higher? Yes, the rear lift blocks in this Rough Country 2 in. Leveling Lift Kit will raise the rear of your truck about 1" higher over stock. This will lift the whole truck 2".. keeping the front a bit slanted down.. or will this raise and level the truck..? The Rough Country 2 in. Leveling Lift Kit will raise the front 2" and the rear 1" to level your ride height. The Rough Country 2 in. Leveling Lift Kit can allow fitment up to 33" tires. The Rough Country 2 in. Leveling Lift Kit w/ Shocks comes with the strut extensions to fit the front, which do not require new struts. Since the kit also comes with rear lift blocks, it is also going to lift the rear of the vehicle as well. Lifting the rear will require new shocks as the stock units are too short. Hello! Thank you for pointing that out, I am not quite sure where the mixup came from,. This kit is a 2" leveling kit, not 2.5". Thanks! This kit gave my truck the look I wanted while maintaining some rake for hauling and towing. Allowed me to fit larger tires for a more aggressive look. I think 2" is the perfect lift for the truck if you want a more F-250 / beefy look (as opposed to 4 and 35 inch tires) . My Garage door is 7" so if I oversize the tires I'm still ok. The 1" rear looks great too. The U bolts are slightly long for the 1 in blocks but not a concern. Why 4 and not 5 stars? I will say the shocks did provide a little too much "motion in the ocean", not quite a 1975 waterbed but not firm enough for me. I ordered the Fox 2 read shocks from Merican Trucks and the ride is perfect. 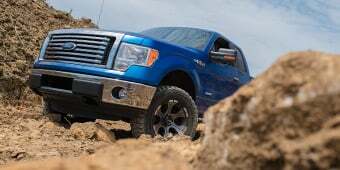 For F-150 folks puting on the rear shocks, make sure you have a torque wrench, 18mm 6 pt. wrench and 18mm deep impact socket if using impact wrench. Rear took about and hour. Needed to level out the look to fit some bigger tires. For the money it was well worth it. My F150 sits great now. Love it! Had a garage help install (tools and lift). It went on easy in a few hours. did brake pads while it was apart. Fairly easy install. Truck rides really nice. I do most highway driving and it's very hard to tell the difference from the day I bought it. Highly recommend using an alignment shop that has experience aligning lifted / leveled trucks. The install wasn't bad at all. The ride after the installation is a lot tougher. Wouldn't recommend putting this on your daily driver. Easy to install if you have a lift, oar know someone with a lift. Took half 4 hours to install. I am pleased with the overall stance of the truck. Gas shocks helped when towing and hauling. All correct parts and was a quick install, less than 2.5hrs alignment. Well worth getting the rear kit as well, truck is level when towing toyhauler. This is a great kit for the cost. Certainly cheaper than going the full suspension route for a level. Thank you Rough Country and thank you American Muscle!!! Happy with the results....just what I wanted. Do not recommend doing this at home....correct tools and bay will save you a lot of time. Other than that is great considering the modest price. This is the perfect height I wanted Cleared my tires Installation was easy (if you know what you’re doing) And looks great. Just the look I was looking for! This kit is just the look I was looking for. Brought my ride height up just a tad and leveled out the front end perfectly. Intall was pretty straight forward and I did it myself. The kit seems to be of good quality as well. Very pleased with it. Well worth the money. Easy to install. 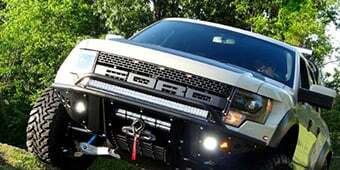 Good project to do at home for a little more height on your truck. Good product easy install took the whole afternoon!! 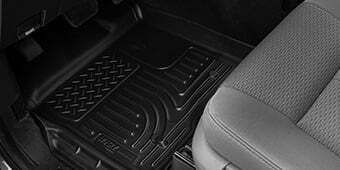 Great product, after installed my truck maintained a smooth factory ride. Me and my brother installed this kit. First off, it's not really a level kit. 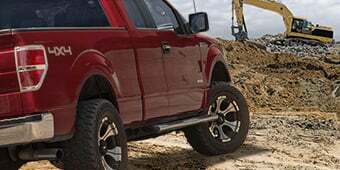 This kit includes a 1 " spacer for the rear springs, new shocks for the rear as well as the 2" front spacers.15' thru 17' crew cab f150 has a 2.5" rake. Put the front spacers in, and you have a 1/2" rake, then install rear spacer, and you come out with a 1.5" rake. So after all that work, your truck will still not be level. 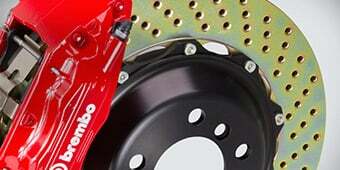 To install, you have to disassemble your cv axel, on top of all the other steering/suspension components. If you don't, you risk damage. Also I had to rent a spring compressor to be able to rotate spring 180 degrees. The strut studs/ bolts were a pain to get out. Just a heads up for everybody, if you are a novice with not all the right tools and knowledge, this will take a loooong time. 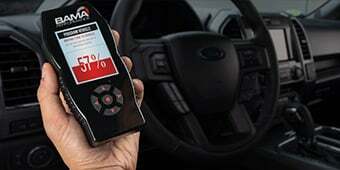 If you are an experienced mechanic, with the right tools, it shouldn't take more than 3 hours. The kit comes with everything u need and doesn't affect ride quality. Im very happy with the results.